And their delicate purple-hued blossoms. Or a shovel for permanent removal. But isn’t it really all in the viewpoint? And seeking, often find exactly that. Just might have scales covering their eyes. Perfection that’s never attainable on earth. Isn’t it really all in the viewpoint? Maybe at times we’re all like wild violets. And hope, by persistence, to live long enough to matter. We wither and sink into shadowy oblivion. Shouldn’t we, like the violets, thrive despite obstacles? Rail against the naysayers and their name-calling? 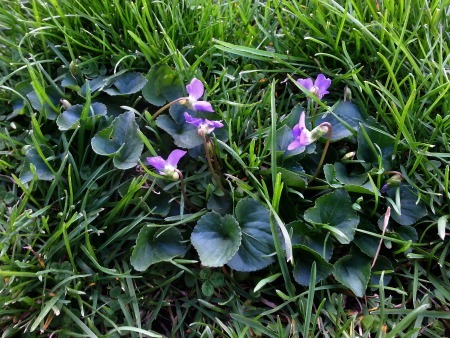 Note: Wild Violets, like those pictured above, can be a homeowner’s bane if allowed to grow and spread indiscriminately. Removal can be challenging, especially for those unwilling to apply chemicals. But for the determined, there are organic methods available. Do you consider wild violets to be beauty or beast? This entry was posted in Seasonal and tagged poetry, wild violets. Bookmark the permalink. All the things that grow from the ground are beautiful to me, even a stinging nettle. But such rampant things like the wild violets must be shown a firm hand. There is room enough in the garden for all the pretty things, but they must not be allowed to take over. My own garden is full of wild flowers and the bees love them! Your garden sounds perfectly delightful, bees and all!! I do suppose wild violets need to be corralled, but I just can’t bear putting chemicals on the lawn (and chancing that darling Dallas will get cancer from them). So if the violets want to take over, I have to look on the bright side — at least they’re pretty! I’m especially concerned about Dallas and am extra-careful when we walk to keep him off treated lawns. But neither do I want to be responsible for injuring an unsuspecting kitty, bunny, or bird!! A weed is simply a plant that’s thriving where humans don’t want them. If violets showed an inclincation to grow in my yard, I might just let them have their way. Of course, I can’t imagine violets acting like dandelions, and taking over. That might change my view a bit..
Over the years, I’ve grown less enamored of the traditional “nice lawn,” which requires inordinate amounts of water, chemicals, and so on. There are so many native plants being used as groundcovers here, and they are lovely. I find myself saying, “Hear! Hear!” over your comment, Linda. Having a pristine yard is less and less a goal. Would it be nice? Absolutely, but I just don’t find yard work that interesting. Nor do I want to ruin Dallas’s health, since far too many chemicals are suspected of causing cancer, seizures, and other bad health conditions for pets. I suppose I could hop outside and dig the violets up, but recalling my experiences the last couple of years with the snakes trying to sun in the grass and on the patio, well, I think I’ll just let Mother Nature alone! Theyr’re wild violets? That’s so cool! I”ve got some of those! Do you, Professor? That doesn’t surprise me, as I think they’re pretty prolific all over the U.S. and Canada where the soil is moist (and we’ve had a LOT of rain!) It’s said their leaves are edible, but I’m not going there. I found these in the back yard, and who knows what beasties have been trampling them underfoot?! Wonderful post. I personally believe every flower is a smile, and if you spend all your time trying to eradicate the smile, you are only left with a frown. Ah, Morgan, spoken just like a poet, ma’am! I do believe you make an outstanding point. A smile uses fewer muscles than a frown anyway, or so I’ve been told! Ground cover gives me the willies. No telling what’s hiding underneath that stuff — think snakes…eek!! Definitely a flower! Now the Professor has weeds. Onion weeds that stink. Great food for thought this morning, Debbie. I used to get them and I never saw them as a nuisance. Thanks so much, DD. I suppose at this greening time of year, anything colorful looks pretty after staring at bare limbs and brown and snow all winter! Yes, the Professor has stinky onion weeds, but he says he has wild violets, too. I think I’d prefer the flowers! I think so, too! Flowers make me smile, and I had to smile when I saw these guys. What an INSPIRING post, Debbie. And so beautifully written! It reminds me of the importance of “perception.” And not just when come to weeds, but also life experiences that happen to us. It’s all in how we choose to see something. Also, I wonder if we didn’t know that a weed was a weed, would we just automatically see them as a beautiful flower. Thanks for sharing this today, my friend! Have a faaaaaabulous week! YES, Ron, that’s what I was trying to show…it’s all in our outlook. And I think you’ve hit the nail on its head. Sometimes we’re told how to look at something (say, a weed), so we blindly accept that, regardless of how much beauty the thing might have. Too often, I think, we judge people in just the same way, and that feels wrong to me. We miss a lot in life by classifying things as “good” or “bad,” without regard to looking the thing over for ourselves. Some so called seed are pretty little things. I got some great macro shots of some last weekend. It’s all in the eye of the beholder. A field of wildflowers is a sight to behold, Suzi! Yes, cultivated flowers are lovely, but I can’t help admiring the “wild” ones that spring up whenever and wherever they please! Love the poem, Debbie! Definitely all in the viewpoint – let the little things grow, I say! Thanks for the kind words, FF. I’m with you on this one…why eradicate something so brave and so beautiful?! They probably don’t grow well in sandy soil, John. We’ve had so much rain of late that I’m surprised yards aren’t covered with them! And no way I’m taking a shovel to dig all of them out, then fret over bare spots in the grass. Me neither. Guess they’ll just have to grow — at least they don’t have thorns, stickers, or smell bad!! Violets! I put them in the beauty category. Of-course, I love anything purple. And am longing for a few bluebonnets. Bees these days are a blessing. I just read this natural, inexpensive way to rid your yard of weeds you do want to kill. Mix and spray in the morning after the dew has evaporated. The weeds will be gone by night. Bonus- This weed killer recipe is rumored to annoy Monsanto—which is a good enough recommendation for me. It sure beats Round-up. Don’t get me started on Roundup, Katybeth. I’m pretty sure that’s causing all sorts of health problems for pets, and no way do I want that on our yard. Thanks bunches for the natural weed-eliminator. Sounds like that might do the trick — and ticking off the big chemical companies is a side bonus! I love the color of these violets and how pretty they are upon the verdant grass, however, my allegies are going crazy due to them, so I see weed. Who am I kidding? I see beautiful flower! I know what you mean about the allergies — I refuse to go a single day without my Allegra!! These are too pretty to be a weed. And yes, like the poem about a dandelion being a flower indeed in the hands of a child of God – it’s got so much to do with one’s perspective. Thanks, Barb. I like to think of it as a flower, too — though I imagine there are things we call weeds that are quite lovely.